Once the home to successive bishops of Caithness, Skibo castle is a truly romantic and stunning construction mainly due to its renovation by the celebrated American millionaire Andrew Carnegie at the beginning of the last century. 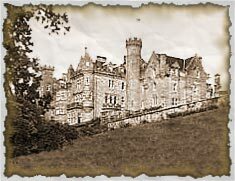 The main ghost story of this castle relates to a local girl who centuries ago is said to have visited the castle and to have disappeared - apparently murdered by the Castle's keeper. It is said that he hid her body within the grounds of the castle and that soon after, a ghostly 'White Lady' began to appear. Later renovations led to the discovery of a female skeleton behind a castle wall and after a formal burial the haunting apparently stopped only to begin again later. It was in 1898 that the American millionaire Andrew Carnegie bought the ruined estate and set about his ambitious programme of rebuilding, the result of which we see today. His grandson Rosewell Miller the third apparently caught sight of the White Lady drifting along a corridor and turning into a bedroom. He followed her into the room but she had disappeared! This magnificent castle hit the headlines in the year 2000 when pop star Madonna and film director boyfriend chose to get married in this splendid Highland castle. Read more about castles today and castle weddings.